To have a healthy old age you must act now, whether you are 30 or 50. I have two great passions – sharing my love of cooking delicious simple food and improving the health and nutrition of older people. I hope this cookbook does both but it’s not for ‘old’ people, it’s for you. I have been delighted to work with leading Alzheimer’s researcher Professor Ralph Martins in recent years and I have learned that if we are to avoid Alzheimer’s and other lifestyle diseases it is what we eat today that matters. Maggie Beer is one of Australia's best-known food personalities. As well as co-hosting The Great Australian Bake Off, appearing as a guest chef on MasterChef and writing books, Maggie devotes her time to her export kitchen in the Barossa Valley, which produces a wide range of pantry items for domestic and international markets. These include her famous verjuice, pate and quince pastes, her ice cream as well as her sparkling non-alcoholic grape drinks. In 2001, Maggie was awarded the Centenary Medal for her service to Australian society through cooking and writing, and in 2010 she became a Member of the Order of Australia (AM). 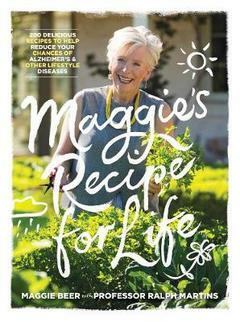 Maggie is the author of eight successful cookbooks: Maggie's Christmas, Maggie Beer (Lantern Cookery Classics), Maggie's Verjuice Cookbook, Maggie's Kitchen, Maggie's Harvest, Maggie's Table, Cooking with Verjuice, Maggie's Orchard and Maggie's Farm, and co-author of the bestselling Stephanie Alexander and Maggie Beer's Tuscan Cookbook.